As a Walden student, you’ll find several resources available to you to help fund your education. Our enrollment advisors, along with our knowledgeable financial aid advisors, are committed to helping you identify your options and answer any questions you may have about the financial aid process. Two-thirds of Walden students currently receive some form of financial aid. Many defray up to 100% of their tuition and fees through Federal Direct Loans. If you are an international student, explore resources for funding assistance. If you are an active member of the U.S. military or a veteran, many assistance programs are available to you to help pay for your higher education. Walden expects its financial aid advisors to always maintain exemplary standards of professional conduct in all aspects of carrying out their responsibilities. Read the Walden University Financial Aid Code of Conduct for additional information. You can also visit https://studentloans.gov or https://studentaid.ed.gov/ for articles, tools, and forms that will help you manage your federal aid. Hi! Today, I’d like to walk you through the financial aid awarding process. You’ll need to log in to your myFinAid portal to get started, so let’s go. To start your awarding process, you will have to have complete your FAFSA, or Free Application for Federal Student Aid. If you haven’t submitted that yet, then you’ll need to do so at least a month before your term starts. 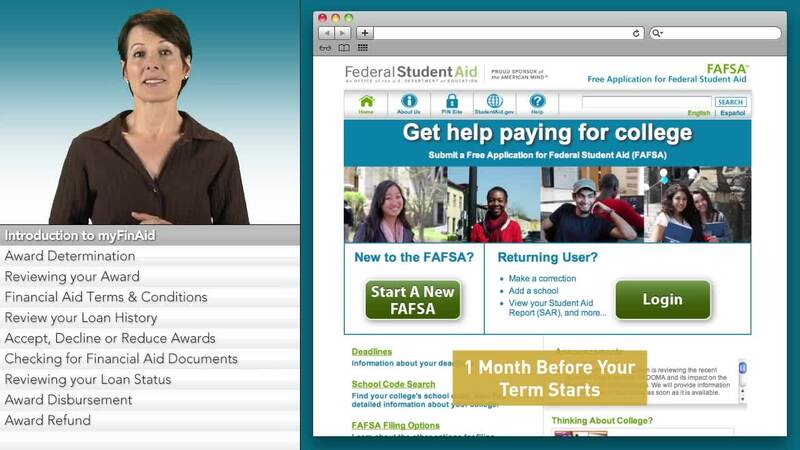 After your FAFSA is submitted, you’ll want to log in to the portal to begin tracking your financial aid. When you log in, first use the dropdown menu in the upper right-hand corner of the page to select the award year you want to view. As a continuing student, you’ll have to choose the current award year. If your FAFSA hasn’t been processed yet, then you’ll only see the previous years. If you are a new student, then you’ll have to wait 5 business days from when you submitted your FAFSA before you can first log in. Once you are in the correct award year, click on the “Documents” tab. You’ll want to visit this tab often because whether you’ve been awarded aid or not, you may have documents here to complete. Once your FAFSA and any additional documents are completed, your financial aid application will be reviewed for an award determination. When your awards have been determined, you’ll be notified through your Walden email. Then you’ll need to come back to your portal. To review your awards, click on the “Awards By Term” tab and scroll to the bottom. The subtotal combines all grants, loans, and scholarships you’re eligible to receive. You can use this figure to compare your university charges with the aid you’ve been awarded. Keep in mind that the date to the left of the fund refers to the start date of the term for which you’re receiving aid, not the disbursement date. The financial aid award year at Walden is generally three terms, and new awards are made on a rolling basis. Next, you’ll want to click on the “Accept Awards” tab. If you’re ready to make a decision about your awards, you’ll need to agree to the term and conditions first. These explain how the awarding process works. They help you set your expectations and plan accordingly. After you click “Agree,” you’ll be taken to a new page that shows your awards..
At the bottom of the screen, you’ll have the option to Accept the full award, reduce your award amount, or Decline your awards altogether. You don’t have to accept all of the aid, but it’s smart to review your loan history before accepting any of it. You can do this on the “Loan History” tab, which shows the outstanding and pending amounts for your federal Stafford Loans according to the National Student Loan Data System (NSLDS). These amounts are important to know because they count toward your lifetime aggregate loan limit. There are limits to how much federal loan money you can borrow in your lifetime, so this tab will help you calculate how much money is still available to you. If you want to accept all of the aid listed, simply click the “Accept All” button. After you’ve finished making your award decisions, you should return to the “Documents” tab. It’s a good idea to check there to see if there are any new documents or forms you need to complete. If you’re taking out loans, you can use the “Loans” tab at any time to check on their status. Once your loan shows “Sent to lender,” it will be ready for disbursement. Disbursement is when the lender actually sends your financial aid money to Walden. So when will your funds be disbursed? You can use the “Disbursement” tab to find out. This tab displays the scheduled and actual disbursement dates for your financial aid. As a general rule, disbursement occurs on the second Friday after the start of each term. When Walden receives the funds from the lender, we apply them to your outstanding bill. If there is money left over after your tuition and fees are paid, we’ll send it to you as a refund within 14 days of the disbursement date. And now we’re done! It’s that easy. I hope you found this overview of the Walden University financial aid awarding process to be helpful. You can find more detail on each tab we’ve just reviewed by visiting the myFinAid portal. If you have any trouble in your portal or need assistance with financial aid, you can call us at 1-800-WALDENU or email us at finaid@waldenu.edu. Thank you, and best of luck as you continue your studies at Walden! If you are a U.S. Citizen or an eligible noncitizen, you may be eligible to receive federal financial aid, which can help you fund your higher education. Walden University is certified by the U.S. Department of Education to participate in a variety of grant and loan programs. We are committed to helping you put your degree within reach by providing millions of dollars in tuition assistance across many programs through scholarships. Find out what funding options are available for your program or certificate of interest. Forms provided by the Office of Financial Aid. Understanding the following terms will help you easily navigate the federal financial aid process. Use our Net Price Calculator to estimate the cost of your degree.